Check out Kim Lee Learning LLC for Math and Thinking Camps this summer to help your child have fun and learn during the summer! Now available on my website is online payment and registration! Some of my camps are almost filled. Getting Ready for Grade 4 and Grade 6/7 have 1 spot left. Grade 1 has 2 spots left. The other camps have a few spots left. 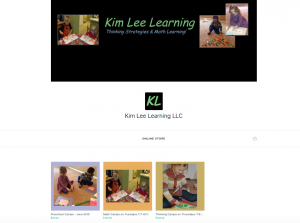 Please check out my website at https://kimleelearning.com/ and share with others my facebook page. Contact me at info@KimLeeLearning.com if you have any questions.